Item # 270458 Stash Points: 97 (?) This is the number of points you get in The Zumiez Stash for purchasing this item. Stash points are redeemable for exclusive rewards only available to Zumiez Stash members. To redeem your points check out the rewards catalog on thestash.zumiez.com. 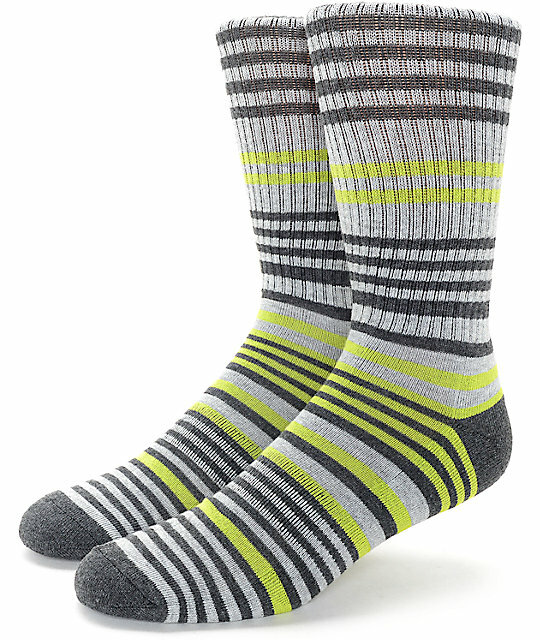 Keep your feet warm with style in the Stand By green and grey striped crew socks from Zine. These jacquard knit socks have a padded footbed for comfort and the ribbed elastic upper makes sure these socks don't slouch for all day wear. Stand By green and grey striped crew socks from Zine. Jacquard knit stripe pattern throughout. Sizes fit men's shoe size 9 - 13. 92% polyester, 65 rubber, 1% spandex, 1% other fiber.